Hey there i am trying to reconstruct the envelope of the Roland MC-202 LFO Delay with axoloti. 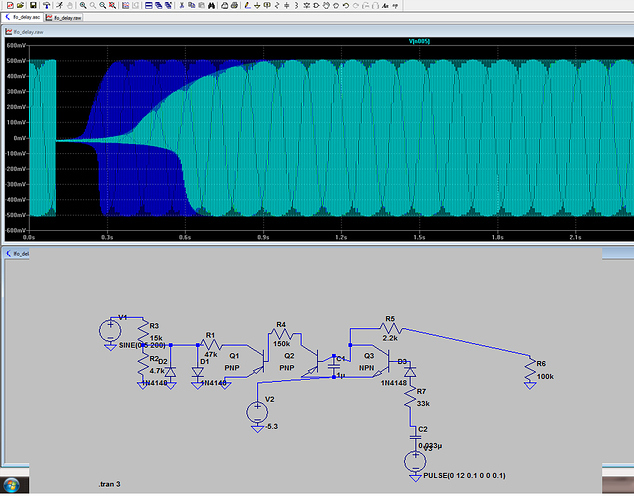 on the screenshot of my ltspice simulation of the 202 circuit to do this. you see what happens on a gate signal. The amplifier of the lfo signal goes quickly to low voltage than it starts soft exponentially and stops soft. It looks like the curve of limited growth formulas (google it..). I dont need to have a perfect copy of the 202 circuit but I would like to have this soft beginning and soft stop of the envelope. Also the behaviour of stretching the envelope with increasing delay time would be nice. I could not manage to find a solution how to do this so far. Can someone help me out a little bit? Are you trying to emulate the exact behaviour of that especific LFO Delay or just wnat to add Delay to an LFO? If the case is the later just add a VCA (or multiplier) after the LFO and control it with an AD envelope (Yo may choose one with exponential or linear or inverted exponential behavoiur to suit you taste). I tried it with AD envelope objects + an inverter. But is another curve. it is only half of the curve. Only the soft end is there but exponential attack or decay curves start straight not like in the picture above.... I am searching a possibility to get soft start and soft end of the curve. But i dont know why at the moment. did you try something like this? Hey, thank you very much for the ideas. I am bit busy now but I ll concentrate on this later to see if it is possible with the distortion. It perhaps its just the right thing to try! I tried to understand how to translate the formula ( f(x) = x / (1 + abs(x)) ) to fixed point math but I dont really understand it. I read about it here http://community.axoloti.com/t/coding-axoloti-objects/2606 but it is not clear to me after reading the fixed point math section. I dont know what a magnitude is in this context and also not why logarithms are important.